Colorado Springs, Colo., Feb. 22, 2013 – Mayor Steve Bach joined representatives from SSP America and Colorado Springs Airport (COS) to welcome two new arrivals to the airport - Bristol Brewing Co. and Novo Coffee - with a grand opening celebration. The late Thursday afternoon event was commemorated with a special cask ale tapping ceremony, food and beverage samplings, and a shuffleboard tournament. Cradled at the southern base of nationally famous Pikes Peak, the Colorado Springs Airport sits in one of the country’s most beautiful regions. The 12-gate, 280,000 square-foot gateway serves nearly two million annual passengers, is located close to 14 major ski areas and is just over an hour’s drive south of Denver. And now, travelers to the mountain region looking to sample an artisanal local brew while admiring the majestic panoramic views through the concourse windows will be spoiled for choice. Located conveniently just before security, COS passengers, airport patrons and local residents are now officially welcomed at the gates of the city by Bristol Brewing Co. and Novo Coffee, serving a taste of the region's flavors without leaving the airport. Bristol Brewing Company brews fresh, distinctive beers for the people of Colorado, with bottles and draughts available across the state. At the airport Taproom, Bristol’s five flagship beers – Laughing Lab Scottish Ale, Red Rocket Pale Ale, Mass Transit Ale, Compass IPA and Beehive Honey Wheat – are on draught year-round, with special appearances by Bristol’s seasonal and specialty brews. For those who can’t decide, the Bristol Sampler features three-ounce samples of each available Bristol beer. In partnership with Bristol, SSP America is offering a full menu including starters, soups/salads, burgers and sandwiches, and, five hot breakfast items. Coffee connoisseurs are equally served with Denver-based artisanal roasters, Novo Coffee. Family-owned and operated since 2002, Novo Coffee is a roasting company committed to sourcing and roasting some of the world's most flavorful coffees. Coffees are purchased through long-term relationships with farmers who share in Novo's belief in sourcing only the highest quality beans grown with a commitment to social, environmental, and economic sustainability. Roasting is done in small batches and profiled in a way to ensure that the inherent flavors in each coffee are brought to the forefront. Hours of operation: The Bristol Taproom and Novo Coffee open at 7:00 am and close with the last flight. Beginning in mid-March 2013, the Airport will also validate parking with a minimum food or beverage purchase at either venue. The Colorado Springs Airport serves as the first impression for thousands of visitors, giving them a breathtaking view of Pikes Peak and a taste of Colorado hospitality. Approximately 2 million passengers pass through the terminal each year. The airport handles around 75 commercial arrivals and departures per day and is served by five airlines. COS has non-stop service to 11 U.S. cities, and travelers have access to over 1,500 destinations with only one connection. For more information, please visit www.flycos.com. In 1994, Bristol Brewing Company settled comfortably in the lap of Pikes Peak and began hand-brewing flavorful, one-of-a-kind ales for the people of Colorado. 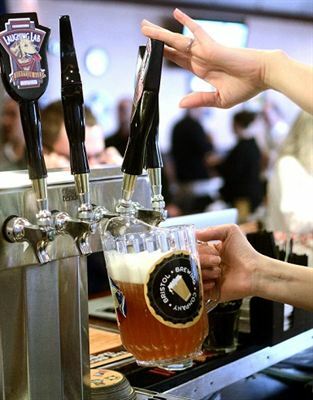 From its award-winning Laughing Lab Scottish Ale to its seasonal beers and Community Ales, Bristol Brewing Company's world class beers are available on draught and in bottles in select locations throughout the state. For more information, please visit www.bristolbrewing.com. Novo Coffee is a Denver-based, family-owned and operated roasting company with a commitment to sourcing and roasting some of the world’s most flavorful coffees. These coffees are purchased primarily through long term relationships with farmers who share in Novo’s pursuit of the highest quality coffees along with strong commitments to social, environmental, and economic sustainability. For more information, please visit www.novocoffee.com. SSP is the leading dedicated operator of food and beverage brands in travel locations, operating restaurants, bars, cafes, food courts, lounges and convenience stores in airports, train stations, motorway service stations, shopping malls, conference centers and other leisure locations. With a heritage stretching back over 60 years, today SSP has 30,000 employees, serving millions of customers every week. It has business at over 140 airports and over 250 rail stations, and operates more than 2,100 units in 30 countries around the world. SSP operates an extensive portfolio of over 200 international, national, local and specialty brands. These include Upper Crust, Starbucks, Caffè Ritazza, M&S Simply Food, Bonne Journée, Caviar House & Prunier, and leading Japanese noodle brand Ajisen Ramen as well as stunning bespoke concepts such as the Montreux Jazz Café in Geneva and the Bambini Wine Room in Sydney. Its brand portfolio is tailored for each specific location, depending on variables such as passenger profile, consumer need states, location type, size and design. SSP America/Canada operates in more than 40 airports across North America bringing a variety of local, regional and national brands to the traveling consumer at a vast array of price ranges. Third party brands in the company’s broad portfolio include The Palm Restaurant, Einstein Bros. Bagels, Gordon Biersch, Panda Express, Tigín, Peet’s Coffee & Tea, T.G.I. Friday’s, Tim Hortons, The Great American Bagel and Buffalo Wild Wings. SSP America’s brand portfolio also includes strong, local award-winning icons such as Laurelwood Public House & Brewery, Harry & Izzy’s, Nonna Bartolotta’s, and Alterra Coffee. For more information, please visit www.foodtravelexperts.com/America. SSP is a leading operator of food and beverage outlets in travel locations, operating restaurants, bars, cafés, food courts, lounges and convenience stores in airports, train stations, motorway service stations and other leisure locations. With a heritage stretching back over 60 years, today SSP has nearly 30,000 employees, serving approximately a million customers every day. It has business at circa 130 airports and circa 270 rail stations, and operates approximately 2,000 units in 29 countries around the world. SSP operates an extensive portfolio of approximately 300 international, national, local and speciality brands. These include Upper Crust, Starbucks, Caffè Ritazza, Burger King, M&S Simply Food, Millie’s Cookies, O’Learys, Caviar House & Prunier, and leading Asian brands Ajisen Ramen and Saboten, as well as stunning bespoke concepts such as the Montreux Jazz Café in Geneva and the award winning Center Bar at Zurich. Its brand portfolio is tailored for each specific location, depending on variables such as passenger profile, consumer need states, location type, size and design. SSP America/Canada operates in more than 30 airports across North America bringing a variety of local, regional and national brands to the traveling consumer at a vast array of price ranges. Third party brands in the company’s broad portfolio include The Palm Restaurant, Einstein Bros. Bagels, Gordon Biersch, Panda Express, Tigín, Peet’s Coffee & Tea, Tim Hortons, Buffalo Wild Wings, Shake Shack, Freshii and Red Mango. SSP America’s brand portfolio also includes strong, local award-winning icons such as Laurelwood Public House & Brewery, Harry & Izzy’s, Nonna Bartolotta’s, Four Peaks Brewery and Humble Pie.